I love living in the South. The seasonality of the food allows me to create for some great dishes and drinks with local and organic ingredients that are only available for a brief period of time. For the last few weeks, I’ve been working on a light weekend drink that includes Sweet tea, Georgia peaches, and bourbon. It’s a lot of steps, but you can make everything in advance and enjoy it as time permits. The work is well worth it! Bourbon- use what you like! 1.Bring sugar, water and peaches to a full boil in a small saucepan. Lower heat and use a wooden spoon to stir and smash the peaches to infuse the flavor. Add a tablespoon of lemon juice to balance sweetness. 2.Once the sugar is fully dissolved, cover, remove from heat and allow the syrup to set for 30 minutes. Have a shot of bourbon for your effort. 3.Brew some tea! Pour 8 cups of water in a large pot, wait for it to boil, and allow 4 tea bags to steep for no more that 4 minutes. Remove tea bags, strain over cheesecloth, and transfer to a pitcher. Refrigerate for a least two hours. 4.Once the simple syrup is finished, pour into a bottle or container over a mesh strainer to strain out some of the large pieces of peaches. Keep it in the refrigerator for up to a week. To serve, I like to keep it simple and consistent. 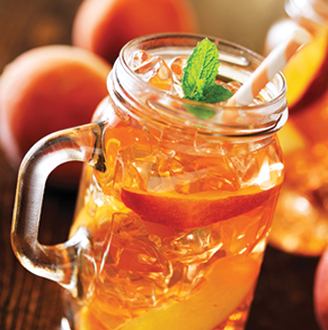 Take a Mason Jar or yor container of choice, fill ½ way with ice, 1 shot of simple peach syrup, 2 shots of bourbon, top it off with tea, and lightly stir.